If you liked my VeganEgg Sausage/Broccoli Quiche recipe but wanted a more meaty version without the vegetables, this recipe is for you. This is using Follow Your Heart's VeganEgg and Sweet Earth Benevolent Bacon to provide a rich, savory, (vegan) bacony experience. 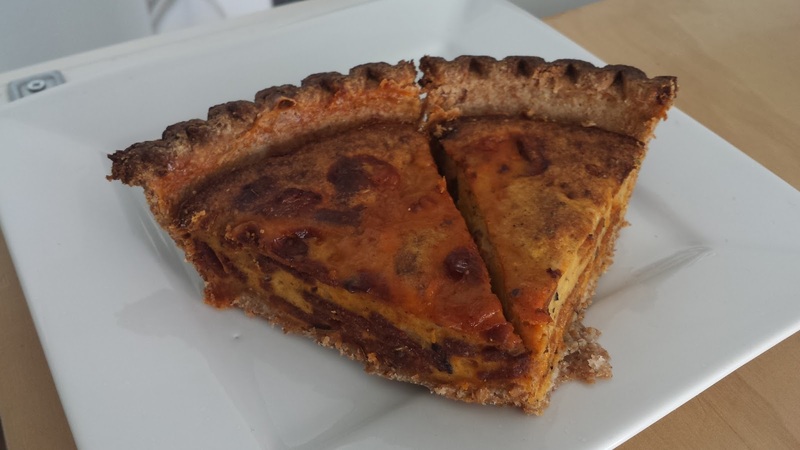 I love VeganEgg in quiche rather than tofu because it has a perfect texture and is never mushy. It's even better the next day after putting it in the fridge to set, then heating it up to enjoy all over again. Usually, I can't wait for that, and will eat it right out of the oven. Enjoy! 0. Pre-heat the oven to 425 F.
1. Beat the VeganEgg together, then add the milk and spices. Once that is mixed, mix in the bacon and cheese. 2. Pour the mix into the pasty shell and place in the oven. Cook for 1 hour. To make sure the quiche is done, poke a knife through the middle. When it's done, the knife shouldn't take a bunch of goopy quicheness out of it. If it does, keep cooking. 3. Let it cool for 15 minutes. It's also good cold, so place it in the fridge and eat it the next day.